Councillor Seloane in Ward 90 has forcibly imposed a reblocking project in the Vusimuzi settlement in Tembisa. This settlement has been seriously neglected by the state for years and years. People are living in inhuman and dangerous conditions. There are not enough toilets and taps, no drainage and uncollected refuse everywhere. People have to make their own electricity connections. The place is infested with rats. But instead of the government working with the community, in a democratic and participatory way, to develop the settlement into a safe and well organised community Cllr Seloane has forcibly imposed a top down form of development that has divided the community, destroyed some people’s homes and possessions, and left many homes flooded in the recent rains. Vusimuzi settlement was founded in 1995. There are thousands of shacks here, with up to 8 people living in each shack. In November last year people were forced to agree to the reblocking project. They were told that if they didn’t sign they will be taken and left homeless on the street. This is intimidation, not participatory and democratic development. All of our letters to various officials and all our attempts to meet with the Councillor have been ignored. The demolitions started in January. The demolishing of homes, as well as toilets, continued last week. Homes are not only being demolished to open space for roads. Sections of homes are also being demolished when they are said to be ‘too big’. People have been told that the Councillor will open the space to new people. It is rumoured that the new people have paid the Councillor, or his followers, for this space. It has also been rumoured that access to the nearby RDP houses was allocated on a corrupt basis. A total of 174 shacks, as well as a number of toilets, have already been demolished as a result of this project. As well as losing their homes, or parts of their homes, people have also had their property damaged. The demolitions have also resulted in many homes being flooded as the water now runs where walls, homes or toilets have been destroyed. Some people have been told to rebuild, in much smaller spaces, over toilet holes left where toilets were demolished. Gogo Ndebele has lived in Vusimuzi for 23 years. She came here from Bergville in KwaZulu-Natal. She works one day a week at a funeral company and looks after five grandchildren. Over the years she had slowly built a six-room shack with cement floors. The Councillor told her that her house is ‘too big’, that she has ‘too much money’ and that she ‘must go and buy a house’. Four of the rooms in her home were demolished. She had to sleep outside for seven days. Since the demolition she is having heart pains and struggles to breath sometimes. She can’t sleep at night. She doesn’t know who her new neighbours will be. Ntombifuthi Nxumalo also had her home demolished. The construction workers trespassed in her yard and when she called the Councillor he said that he ‘is not an informal settlements Councillor’. She refused the construction workers to destruct her shack but they promised to call the police. They gave her a smaller space. She went to Cash Build to buy rafters, zincs and nails but now it is raining and her washing machine and other stuffs are outside. Nobubele Nkanga had her space reduced and three unknown people brought into her yard. They opened a street behind her yard and water has rushed in to her home. She has nowhere to keep her stuff, like her washing machine. Her daughter has had to move out of her shack due to lack of space. Families are being separated. On Friday they attempted to continue with the demolitions. The Councillor, a representative from Human Settlements, a construction company and the police were present. Although there is no court order and so these demolitions are illegal the police intimidate people and threaten to arrest anyone who resists the demolition of their home and damage to their property. We mobilised to the stop the demolitions. Our mobilisation including closing the roads and burning tyres. A community meeting was called on Sunday but the Councillor refused to engage with people at the meeting saying that people were signing, and that he couldn’t address a meeting if Abahlali baseMjondolo were present. This is not democracy. Yesterday, and on Monday, we marched on the Councillor. He refused to engage us. They have threatened to return today to continue the demolitions. We estimate that around 200 homes are at risk. If they do return we will oppose the demolitions with direct action. We are also seeking legal support. We are human beings, not dogs. We insist that all development must be participatory, democratic and free from corruption. If there is a good reason why people must move then this must be discussed and decided democratically and not imposed from above with threats and intimidation. People who need to move must be given alternative land with basic services including water, electricity and sanitation. Those who have had their homes demolished and their property destroyed must be compensated. Development that is carried out at gunpoint is oppressive and not democratic. 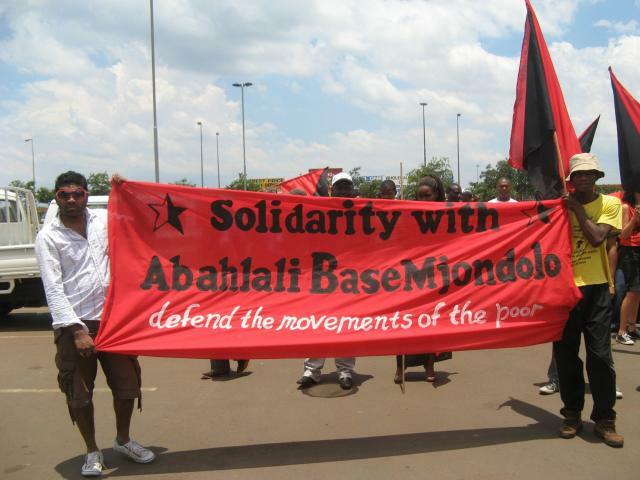 Abahlali baseMjondolo, April 11, 2018. Next post: Live Blog: The Eviction of #ZAD #NDDL Day 4: #ZADResist!